In stock are various types, thicknesses and sheet sizes for every application. Cork is a environmentally friendly, renewably natural resource. By alloying cork & rubber, they have developed materials that combine compressibility and recovery characteristics of cork with oil resistance, flexibility and shelf life of rubber. Cork & Rubber is a product with unique characteristics and applications in a wide range of industries, automotive, electrical equipment, gas, construction, industrial equipment, transport and railway. F-33 is a medium grained (10/20) polymeric bonded grade is our best material where high density and tensile strength are required. A cushioning material used in industrial applications such as thick pads under heavy machinery. Nitrile/cork is high quality, with high compressibility and good oil resistance. This soft nitrile material offers low swell in fuels and oils, making it good choice where bolt pressures are low. Nitrile/cork is high quality, low compressibility, good oil resistance. Use with high bolt pressures. Synthetic rubber, economical, with medium compressibility and oil resistance. A general purpose sealing material offering good performance in a wide variety of applications. Neoprene/cork, high quality, with medium compressibility and oil resistance. Used in air and refrigeration compressors. 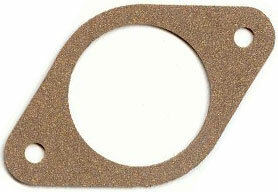 Protein-Glycerine treated cork and fibre gasket material used for general purpose flange gaskets, seals under lower flange loads for temperature under 250°F.